Thanne langen folk to goon on pilgrimages ... "
Thus begins Chaucer's prologue to The Canterbury Tales. April, clearly, was the time to set out on pilgrimage, although not if one wanted to visit Canterbury for the Feast of Saint Thomas, which in Chaucer's time was in July (the journey on foot from London to Canterbury, which I made a few years ago, takes five days). 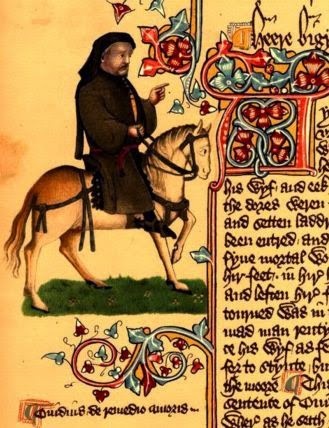 Geoffrey Chaucer, from the Ellesmere Manuscript in the Huntington Library, San Marino, California (image is in the Public Domain). The much longer pilgrimage to Santiago de Compostela is estimated to have taken 90 days (I haven't tested that), so April is pretty much the time at which one would set out (allowing for a few rest days) if one wanted to get there in time for the Feast of Saint James on July 25th. This would have been good timing, since it would allow for the return journey to be completed before winter set in. A 13th or 14th Londoner making the pilgrimage might well have travelled via Canterbury, seeking the intercession of Saint Thomas along the way, before embarking at Dover. 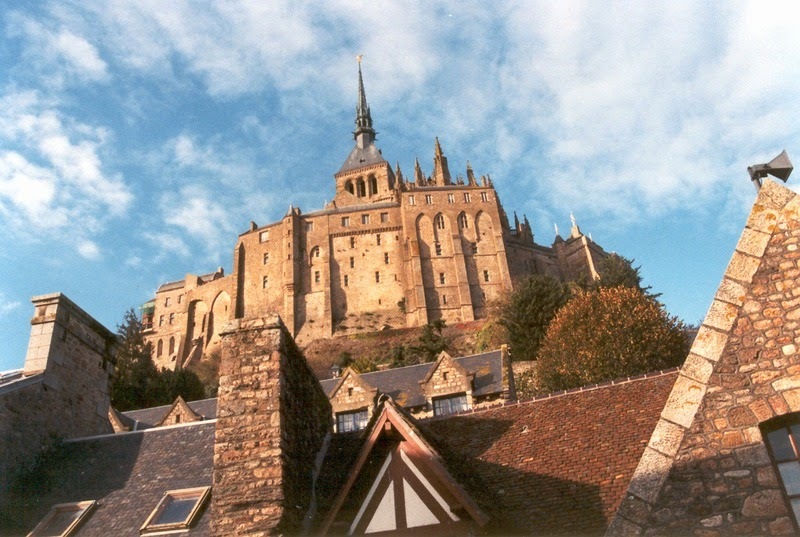 The 12th Century characters in my novel, Omphalos, start out not from London, but from the Abbey of Mont-Saint-Michel in Normandy, where the Abbot would have preached a very specific sermon, the Veneranda Dies. It was significant because it was believed to have been written by Pope Callixtus II. In fact, it is a forgery, but neither the Abbot nor anyone else present is likely to have known this. The Abbey of Mont-Saint-Michel, Normandy. Photo: Zewan (licensed under GNU). "O how blessed are those who have such an intercessor and pardoner! Why, therefore, devotee of Blessed James, do you delay in going to this place, where not only all the tribes and languages, but also all the angelic hosts converse, and where the sins of men are forgiven ... "
"In the name of Our Lord, Jesus Christ, accept this purse ... that it is made from the skin of a dead animal signifies that the pilgrim himself must mortify his flesh ... through hunger, thirst, through many fasts, through cold and nakedness, and through many insults and hardships." The purse or scrip allowed a pilgrim to carry with him some modest resources, which he might supplement by seeking alms along the way. Some illustrations show it as purse-shaped, others portray it more as a small satchel. A German illustration, from 1568, of two pilgrims on the route from Santiago. The pilgrim facing us clutches his scrip in his right hand and his staff in his left (image is in the Public Domain). "Accept the staff as a support for the journey ... the defence for man against wolf and dog ... The dog and wolf signify that way-layer of the human race, the Devil." "If he has been a robber or a thug, let him become a dispenser of alms, if he has been a fornicator or adulterer, let him become chaste. Similarly, may he restrain himself, from now on, from every guilt in which he was previously grasped." Chaucer's pilgrims, even the humble miller, travel on horseback, and some 12th Century pilgrims may have done likewise. The sermon, however, enjoins them to travel on foot, using the staff "almost as a third foot," which "implies faith in the Holy Trinity, in which one must persevere." Only then could pilgrims arrive at the Shrine of Saint James "chastened and cleansed," in readiness for absolution. "The Pilgrimage to Canterbury," by Thomas Stothard, Tate Britain (image is in the Public Domain). Nor, I think, should we imagine many tales being told on the road. My own journey on foot to Canterbury taught me that it is quite difficult for a group of people, of differing ages and levels of fitness, always to stay together. Some inevitably march ahead, others fall behind, a large party breaking up into smaller groups, coming together again at the end of the day, where the tales would be told in the inns and hospices along the way. 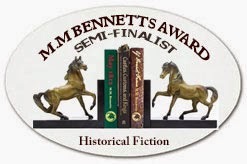 Mark Patton's novels, Undreamed Shores, An Accidental King, and Omphalos are published by Crooked Cat Publications, and can be purchased from Amazon UK or Amazon USA. The pilgrimage to Compostela reminds me of the film The Way, which follows some modern pilgrims to the shrine. Modern but it made me think about the predecessors. Interesting post as usual, Mark.